As the last major stop before Survivor Series 2017, the 952nd episode of SmackDown had a big job to do. The Spectrum Center in Charlotte, North Carolina was treated to an invasion from The Shield, Kurt Angle, Braun Strowman and multiple members of the RAW brand during the main event between Big E & Xavier Woods from The New Day and Kevin Owens & Sami Zayn, as well as the return of Daniel Bryan in a segment with new WWE Champion AJ Styles, but was it any good? The show opened with Shane McMahon rallying his team in a weird curtain area, saying various things about SmackDown and B-Shows. 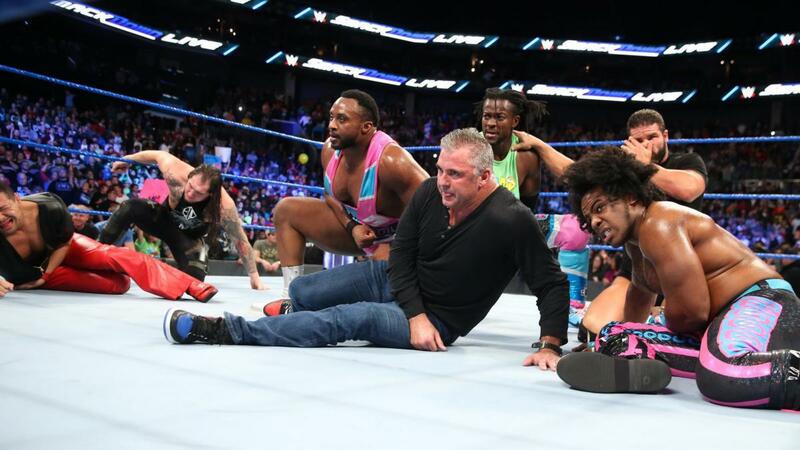 Becky Lynch, Baron Corbin and The New Day all got a little mic time and lads like Mike Kanellis and The Colons were there in the background, seemingly because they have literally nothing else to do. Kevin Owens and Sami Zayn talked in the lockeroom, moaning about not being on Survivor Series, running down the A Show, B Show argument and generally looking like they''d both rather be anywhere else. In the ring, The New Day (Kofi Kingston, Big E & Xavier Woods) cut a wonderfully entertaining promo on The Shield (Roman Reigns, Seth Rollins & Dean Ambrose), comparing the animals that represent the two teams and referencing cuffing season and Gloria Gaynor. Everyone knew it was coming, but that didn't stop The Shield turning up during The New Day's match with Kevin Owens and Sami Zayn being any less fun to watch. Let's start by discussing the match that lead into the invasion, because it was significantly lengthy to warrant it's own discussion. Going about seven or eight minutes, the match was your regular cookie cutter tag bout, an easy watch, highlighted by Big E's belly-to-belly fest of a hot tag. We didn't get a whole of Owens & Zayn in control, with an extended face shine and a straight-forward face in peril sequence, which is perhaps notable after the two were sent home from the European tour last week, although considering The New Day were the only team on the Survivor Series PPV on Sunday, I'm not sure whether it would've been any different otherwise. The crowd seemed to be readying for the arrival of The Shield as soon as Owens & Zayn took control, angling towards the area of the arena The Shield usually arrive from. When the match ended was unclear as The Shield's music hit, moments after a tope con giro from Woods to Owens, before Roman Reigns, Seth Rollins and Dean Ambrose hit the ring. 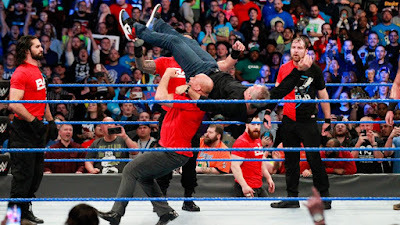 The scrap that followed was wild and rowdy, as The Shield and The New Day (Owens & Zayn bailed before the fight began) were joined first by The Usos and Cesaro & Sheamus and then Samoa Joe, Titus Worldwide, Finn Balor, Shane McMahon, Baron Corbin, The Hype Bros, Bobby Roode, Dolph Ziggler, Shinsuke Nakamura and then finally Kurt Angle and Braun Strowman. In the middle of all this there was Alexa Bliss, Sasha Banks, Asuka, Bayley, Alicia Fox and Nia Jax stormed the SmackDown women's locker room taking down Charlotte Flair, Naomi, Becky Lynch, Carmella, Tamina and Lana, creating a real sense of chaos as the show cut back between the backstage and the arena. The staggered introduction of talent made it feel like something was always happening and the situation escalating, leading to the introduction Strowman by Angle to a big pop. The crescendo where Shane McMahon took a beating at the hands of The Shield, Angle and Strowman set the stage perfectly for Survivor Series bringing the story that's been rumbling for a month to a head and increasing the animosity between the two sides. I found it interesting who was not involved in this with RAW missing Triple H, Brock Lesnar and The Miz, whilst John Cena, Randy Orton and AJ Styles were all absent from the SmackDown side. This segment was brilliant, for the pure fact that you could see how much Daniel Bryan and AJ Styles were enjoying their time on the microphone. 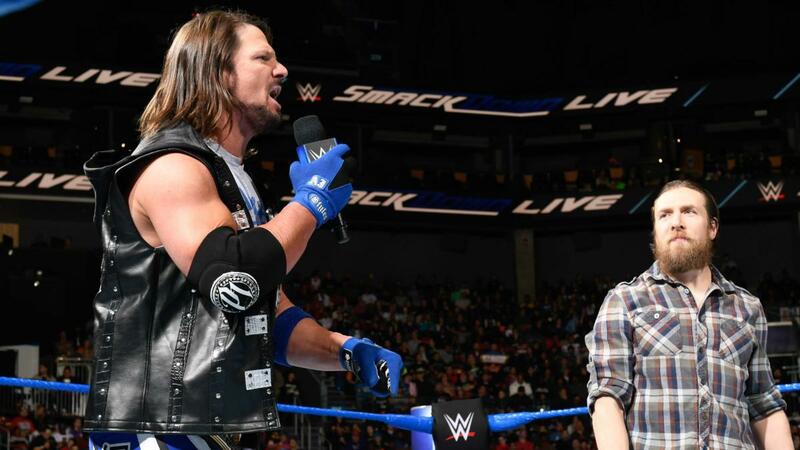 Once Styles was introduced and we moved past the lame "SmackDown is the best" rhetoric, the work on the mic by Bryan and then Styles was exemplary as they pushed Styles' match with Brock Lesnar on Sunday. Bryan offering to be Styles' "advocate" and then mimicking Paul Heyman, referencing his soliloquy from RAW was a masterstroke, with Bryan visibly having a great time in actively getting to promote a match. The crowd was massively into it, as Bryan talked about Lesnar having a tendency to quit, which made me wonder if Bryan had this promo in mind when he was rumoured to be facing Lesnar at SummerSlam 2014. Bryan put over Styles as "the greatest in-ring talent of this generation", a title which many would attribute to Bryan himself and I couldn't help but wonder how great a match between the two on a big stage would be. Styles put an exclamation point on things, discussing his underdog status and concluding on his "House that Styles built" catchphrase to send us into Survivor Series. Jinder Mahal spoke to AJ Styles backstage and completely murdered a promo. Daniel Bryan later talked to Shane McMahon, suggesting they would need to have discussion following Survivor Series. A hometown crowd made Charlotte Flair's first SmackDown Women's title win. The crowd was hot for Flair from the beginning, with the emotional Queen replying with a fiery start, going after Natalya and sending her into the barricade. Even when in wear downs, the crowd was right behind Flair, with the two doing a good job of taking note of the audience, lifting them up and bringing them down at the right points. A couple of well-worked back and forths, like Flair laying in some chops before Natalya rallied with a discus clothesline, as well as a big spot on the outside where Flair went for a moonsault off the barricade and ended up getting powerbombed into the ring-post gave the match some substance, although it was Flair reaching for the ropes whilst in the Sharpshooter that got the best reaction from the crowd. At times, the contest was a little clunky, like an exploder suplex into the corner from Flair where Natalya was shown on camera with a massive smile on her face afterwards and there could have been a lot more work done of the pairs signature submission holds to ramp up the drama and take the contest to the next level. However, for its spot on television this was a good match, that created a brilliant hometown moment that WWE often shies away from. We also have a much more interesting match for Survivor Series with Flair now scheduled to face RAW Women's Champion Alexa Bliss. After the match, Flair cut a quick promo on her match with Alexa Bliss at Survivor Series, before dedicating the win to her father, Ric Flair, mentioning that he was at home watching. Ric would then make a surprise appearance joining his daughter on the ramp, in a well-done emotional moment. On the way to the ring, The Usos (Jey Uso & Jimmy Uso) cut a fire promo on The Bar (Cesaro & Sheamus). 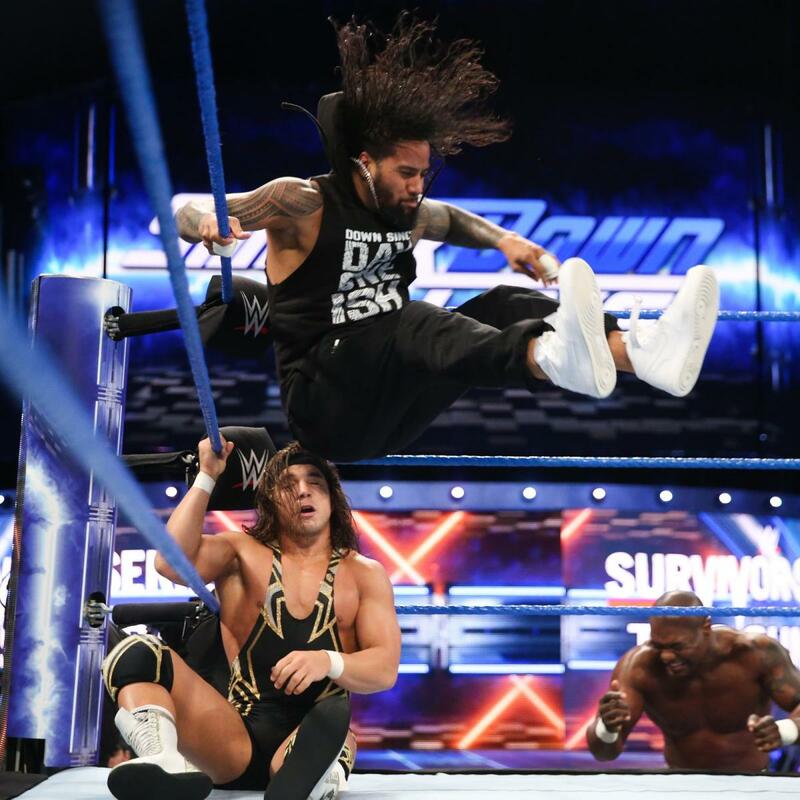 A strong bout that made the most of it's time, creating a good story that called by to 951 and gave The Usos some momentum heading into Survivor Series, whilst keeping the possibility of a future Chad Gable & Shelton Benjamin SmackDown Tag Team Championship rematch in the future. With Gable focusing on Uso's knee, leading into Uso doing the same with a superkick, it was a shame that the match didn't have enough time to really tell that story and build upon it, although both would sell their injuries well, before Jey Uso and Benjamin's antics on the outside lead to Jimmy getting the win with a superkick. A short bout that improved as it went along, beginning with some rubbish punches by Baron Corbin and some clunky back and forth, but finding it's feet later on with a nice sequence into Corbin's Deep Six as well as an Asai Moonsault from Sin Cara. Corbin needed a little programme to give him something to do before Survivor Series and this did it's job, although no one anywhere felt like Cara was a potential threat to Corbin's United States title. Despite the rumours that the gimmick had been dropped, The Bludgeon Brothers (Luke Harper & Erick Rowan) had another vignette, where it was revealed that they'd be returning to SmackDown next week. After RAW had simply done it's job on Monday, this was a much better effort from SmackDown at selling the Survivor Series PPV. The siege aspect was done well, upping the ante from the original confrontation a few weeks ago on RAW, setting up the various RAW vs. SmackDown well, whilst the segment with Daniel Bryan and AJ Styles complimented Paul Heyman and Brock Lesnar's appearance on RAW the previous night. Match-wise things were acceptable, with Charlotte Flair's Women's Championship win in her home town standing out, especially because of the appearance of Ric Flair (which was marginally spoiled the night before when commentary mentioned Ric being backstage). I was pretty hyped for Survivor Series with WWE putting together a great looking card, but this show gave me a little extra buzz for the event, whilst remaining entertaining. Good job Blue brand.